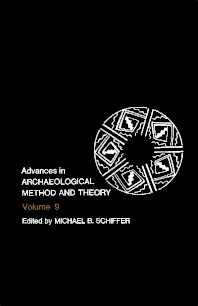 Advances in Archaeological Method and Theory, Volume 9 is a collection of papers that describes protohuman culture, pastoralism, artifact classification, and the use of materials science techniques to study the construction of pottery. Some papers discuss contingency tables, geophysical methods of archaeological site surveying, and predictive models for archaeological resource location. One paper reviews the methodological and theoretical advances in the archaeological studies of human origins, particularly covering the Plio-Pleistocene period. Another paper explains the historic and prehistoric development of pastoralism through archaeological investigation. One paper traces the three phases of artifact classification, each being a representation of a different attitude and approach. Another paper evaluates pottery artifacts using a number of basic materials-science concepts and analytic approaches, toward the study of their mechanical strength; and also reviews their use in archaeological studies of pottery production and organization. To investigate archaeological intrasites, the archaeologist can use different specialized methods such as seismic, electromagnetic, resistivity, magnetometry, and radar. Another paper describes various empiric correlative models for locational prediction developed in both contexts of cultural resource management and academic research. Sociologists, anthropologist, ethnographers, museum curators, professional or amateur archaeologists will find the collection immensely valuable. The Formation of Early Archaeological Sites: Untangling the Web?